What's New for the 2018 Ford Taurus? For 2018, the Ford Taurus offers a bolder, more muscular design that hearkens back to the muscle car styles of the 1960's. The front end has been redesigned to give a sleek profile with smaller headlights and a more aerodynamic grille and bumper. Check out all the other features available on the 2018 Ford Taurus. Ford offers four distinct Taurus models for 2018 that include the SE, SEL, Limited, and SHO designs. 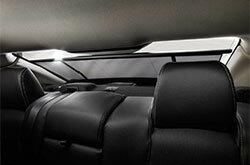 The Taurus offers lots of trunk space along with advanced electronic and safety features. The SE model includes key features such as a SYNC Enhanced Voice Recognition System for Communications and Entertainment, along with 18-inch aluminum wheels with sparkle silver paint and a rear-view camera displayed on an 8-inch touchscreen in the center console. 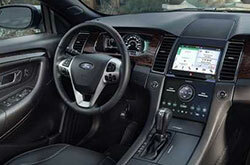 The SEL model features a Dual-Zone electronic automatic temperature control (DEATC), a reverse sensing system, and SiriusXM Satellite Radio, while the Limited model includes a SYNC 3 system along with Audio system from Sony and heated/cooled front seats. The SHO model is enhanced with features such as High-Intensity discharge (HID) headlamps, a 3.5 liter EcoBoost engine, and a special SHO performance package. The standard 3.5 liter Ti-VCT engine provides an amazing 288 horsepower while the 3.5 liter EcoBoost system offers up to 365 horsepower. Combining direct injection and turbocharged systems, the EcoBoost engine provides plenty of torque, creating a wide 1,500 to 5,000 rpm range. The overall performance of the 2018 Ford Taurus is assisted by the twin independent variable camshaft timing controls, providing a mileage range from 18 mpg in the city to 27 mpg on the highway. The powerful 3.5 liter engine is combined with a six-speed SelectShift automatic transmission which Ford includes as standard on all models of the 2018 Taurus. The SelectShift transmission provides automatic override operation and gives you the feel of having control over a manual gear shift without the need to keep reaching for the stickshift. 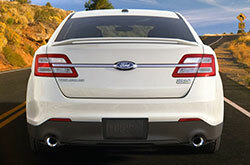 All-Wheel Drive (AWD) sensors help provide enhanced handling along with maximum traction for better control. The National Highway Traffic Safety Administration has given the 2018 Ford Taurus a 5 star rating for its overall rating along with frontal crash and side crash capabilities along with a 4-star rating for its rollover stability. The 2018 Taurus includes standard safety features such as electronic stability control, 4-wheel ABS brakes, and brake assist. 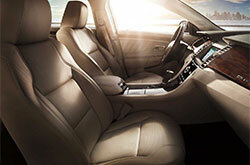 The Taurus also includes front head and rear head airbags as well as front side airbags and passenger airbags. The U.S. News and World Report gave the 2018 Taurus an overall safety rating of 9.4 out of 10 based on crash test ratings and frame strength.